NFL 2016: Offseason: OTAs / Dead Zone / Gumbie Loves Kickers! Draft is over. OTAs have begun, and soon the long Dead Zone slog until training camp. So. I thought the whole Roberto Aguayo thing had given us all the joy it could, at least until Aguayo actually starts mortar-bombing the league. Turns out, Tampa Bay did not have a 2nd round grade on Aguayo. They had a 1st round grade on him. Oh, if only Tampa had picked down in the 20s instead of in the top 10. This could have been so much more fun. As it is, I am smiling, imagining the Bucs sweating as the 2nd round goes by, watching as names come off the draft board, while "AGUAYO, R - PK" clings magnetically to the top of the board, with a vast empty space of vacated spots beneath it. I realize you're trying to troll me, but there is nothing you could conceivably do that would make this pick seem stupider to me than it already has. I had to stop reading the thread on Bucs Nation because it was making me actively angry at the repeated explosions of stupid. They apparently also had first round picks on Donovan Smith, Ali Marpet, and Kwon Alexander, because this has absolutely nothing to do with a GM doing the usual "WE GOTS THE BEST PLAYERS EVER". Connor Barth was signed by the Saints. He will beat Tampa with a kick this year, and it will be fitting. Oh I know your feelings on the pick. Mostly now just looking for excuses to talk about kickers. The story about the first round grade just fell into my lap. Looking at the Ravens roster, I am troubled by how much we will be relying on a rookie class to play significant roles this year. It beats the old version of "Welcome to the Jaguars! *handcuffs*"
Also, +1 for the thread title art. That's like Tampa Bay scouting department level of effort there! So you're saying it's...Gramatica-ly incorrect? Browns cut Brian Hartline. Guess they are liking their gaggle of rookie WRs. Jags working Luke Joeckel at guard. The next highly-drafted-tackle-turned-moderately-successful-guard in the making? Would be nice to get some value out of that damn pick. Oh and hey, speaking of God Hates Jags: Jag rookie DE Jonathan Woodard tears Achilles, will miss season. 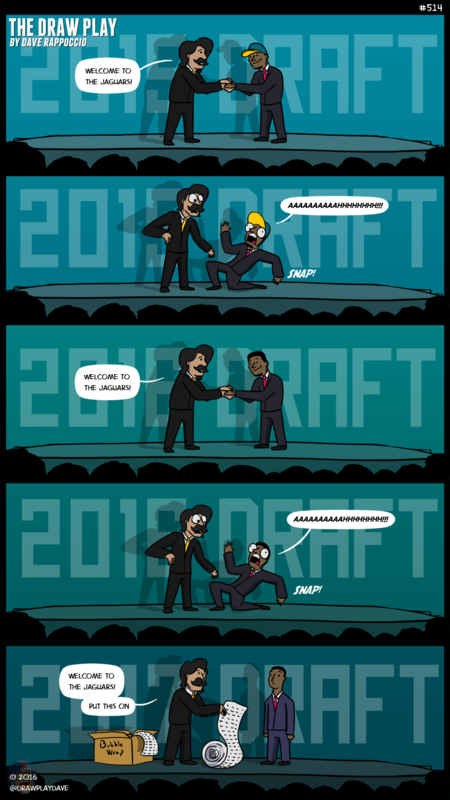 Fortunately this time, it was only a 7th round pick. When I first saw the notification on my phone, I thought it was about 3rd round pick Yannick Ngakoue, which would have been a lot worse. But if God could leave the lower body tendons and cartilage of Jag rookie defenders alone for a while, that would be swell. Martin will get his time in these threads in the weeks to come. I miss the weekly Greg Robinson watch. Jags players getting hurt doesn't fill the same void. I miss having the full PFF access that made that possible! Every now and then, I respond to some PFFer's tweet with some smartass comment about how we'd know X if they hadn't taken away our premium stat access. I know it's not the fault of those writers, but my burning displeasure knows no reason. I hope that their new STATS Inc style business model falls flat on its face and they come back to providing that data to the public. I suppose I'll try and do it with their new 100-point grading system, but without the stats on sacks/hits/pressures, the per-game snap counts, etc., it just won't be the same. As someone who watched a great deal of BH, you don't need to love your other options to not like Hartline. You've probably heard of this elsewhere, but according to ESPN's Outside the Lines, a Congressional report has concluded the NFL tried to influence a government study on concussions. Furthermore, this story was probably mentioned after news of Tom Brady appealing his suspension. Even the links at ESPN.com's front page has Brady above the Congress report. What is up with the Browns releasing Brian Hartline and then picking up a Falcon's reject at WR? It can't be about cap space. It's the New(tm) And(tm) Improved(tm) MoneyBall(TM) Approach(tm). The new WR can do MORTAR KICKOFFS; Hartline cannot. There's a four hour selection show on right now for the 2019-21 Super Bowls. Out of morbid curiosity, I turned to it an hour in and they had already announced all three. What the hell else are they going to talk about for three more hours? The NFL is weird. Damn, I did the quote instead of edit thing. Can't believe I'm one of those people now. Hartline was never a burner (4.5 Combine 40), but I think he lost the top end of the speed he had when he had his PCL tear at the end of 2013. Every number across the board dropped after that point. The name of my new NFL-themed pop-punk band. Everybody under 40 will love their shows, but over 40? Not so reliable. Atlanta, South Florida, and Los Angeles are respectively awarded the Super Bowls in 2019, 2020, and 2021. Atlanta, Miami, and Los Angeles. LA was a given. Once that new stadium opens, it is going to be a mainstay in the Super Bowl circuit. Much like the Rose Bowl in Pasadena was, especially around the time of its renovations for the '84 Olympics. The NFL's absence in LA was an embarrassing failure for a league that does not tolerate much of either. Now that LA is back in the fold, the league won't let it become anything but a monster success. Which is part of why Inglewood won. Carson was just a stadium, Inglewood is an NFL complex that will become the league's west coast base of operations. South Florida?? Miami?? What does that even mean. Are they building a new stadium in that region that I'm forgetting about?